A CRACR of a story… the identification of CRACR2a as a calcium responsive dynein adaptor involved in endocytosis at the T cell immune synapse. Microtubule-based transport of organelles and molecular cargoes is conducted by two families of motor proteins, kinesins and dynein. In order to accommodate the vast structural diversity found within these cargoes, numerous forms of kinesin have evolved, each with different cargo binding capacities and motor properties. Dynein-1 on the other hand is solely responsible for all dynein-mediated cytoplasmic transport (dynein-2 is specific to intraflagellar transport). As such, dynein is reliant on adaptor proteins to couple cargo binding to motor activity in a more specific manner. One of the key roles of dynein is to transport membrane-bound vesicles and organelles. These cargoes are recruited through interactions between the dynein adaptors and Rab GTPases, which reside in the membranes of specific organelles and help confer membrane identity. For example, the adaptor Bicaudal D can bind to Rab6 on Golgi membranes to mediate retrograde vesicle transport (1). In this study Wang et al identify two new dynein adaptors, Rab45 and CRACR2a, which themselves possess Rab GTPase domains, showing for the first time a direct, functional interaction between a Rab GTPase and dynein. CONCLUSION: CRACR2a is involved in a new type of calcium-stimulated, clathrin-independent endocytic pathway at the T cell synapse and CD47 is one of its endocytic cargoes. I chose to highlight this paper because, whilst the identification of new dynein adaptors is always noteworthy, the identification of a single adaptor which not only specifies a vesicle for transport, but also the environmental conditions under which transport should proceed is particularly exciting. Such tight links between signalling and transport using so few proteins is unusual and perhaps necessary for a rapid response. The role of this motor-adaptor complex in clathrin-independent endocytosis (CIE) is also of vital importance to our understanding of this pathway. The molecular mechanisms underpinning CIE remain elusive and, whilst it is not yet obvious how soon CRACR2a is recruited in this process, this discovery could potentially provide an anchor point from which to puzzle outwards. Finally, the observed recruitment of CRACR2a-dynein to endocytic vesicles is a step towards understanding how the enigmatic hand-over of vesicles between the actin and microtubule networks is coordinated at the cell cortex. How important is the Rab GTPase domain and does this bind to other effectors? What other calcium signalling events activate CRACR2a-dynein activity? This study extensively explores the role of CRACR2a in CIE upon T cell activation but is it active during other signalling events such as neurotransmission? And does it always bind to the same cargo if the source of the stimulus changes? What is the link between calcium signalling and the type of cargoes that are internalised by CRACR2a? 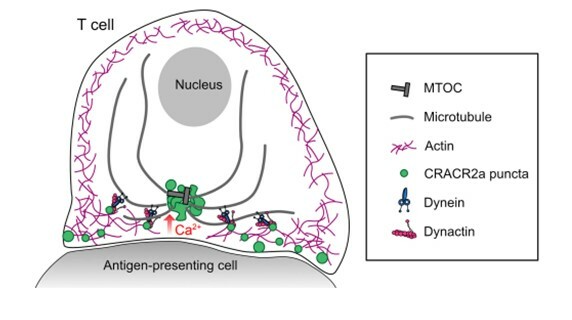 If CRACR2a mediated trafficking is responsive to calcium signalling then it is likely that targeted cargoes have some relevance to the physiological situation the cells are responding too, for example immune synapse organisation. 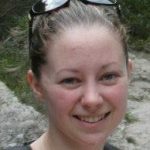 How essential is CRACR2a to immune synapse function?